Pauline Dovas, 92, of Boca Raton, FL died on February 1, 2019 at her residence with her family at her bedside. She was born in the village of Palamari, Greece on May 10, 1926 to John and Eleni (Parnassas) Patsavos. Prior to moving to Ft. Lauderdale in 1990 she resided in Toledo, OH for 40 years. While living in Boca Raton she was a member of St. Mark Greek Orthodox Church. Pauline was a loving daughter, sister, wife, mother, grandmother, and great-grandmother. She is preceded in death by her parents, and her husband, Angelo Dovas in 2014. Pauline is survived by her loving family, her daughter: Helen Halkias and her husband, Louis of Naperville, IL; her sons: John Dovas and his wife, Theresa of Boca Raton, FL and James A. Dovas and his wife, Claudia of Boca Raton, FL; two sisters: Brenda Linardakis of Oakbrook, IL and Evelpia Christopoulos of Pittsburg, PA; six grandchildren and three great-grandchildren. 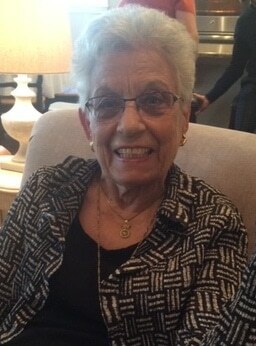 Services for Pauline will be held at 10:00 am on Thursday, February 7, 2019 at St. Mark Greek Orthodox Church located at 2100 NW 51st Street, Boca Raton, FL 33431. Father Mark Leondis will officiate. The family will receive friends at the church beginning at 9:30 am on the day of the service. Graveside services will follow beginning at 12:45 pm at South Florida National Cemetery located at 6501 FL-7, Lake Worth, FL 33449. In lieu of flowers, please make a donation in Pauline’s name to St. Mark Greek Orthodox Church. Helen, John & Jim: Our deepest sympathies on the passing of your mother. How fortunate you have been to have had her for so many years. The Toledo Greek community knew for years how good of a person she was. Needless to say what a good job she did raising the three of you. May her memory be eternal. We are deeply saddened by the loss of your mother. Our deepest sympathies go out to you and your entire family. May God give you the comfort and peace, and may your mother’s beautiful soul rest in peace. She will be greatly missed. Please know you are in our thoughts and prayers. Jim — Sorry to hear about the passing of your mother last Friday. She was always very kind and sweet to me both at your home in Toledo and in South Florida.May she rest in peace! Our deepest sympathies to you and your families. I remember both of your parents as very kind and gracious. May the Lord give you strength in these days of sorrow, and may your Mother Rest In Peace. Memory Eternal!